Do gas appliance categories matter? To anyone installing or inspecting these units, yes. This is important stuff to be aware of. As a home inspector, I sometimes run into some goofy-looking gas vents on garage heaters. These appliances often have what appears to be a traditional metal vent that's pointed down and vented out the side of a building, instead of vented up, the way God intended. Oh, and by the way, a garage heater is properly referred to as a unit heater. While this looks like a goofy, improper installation, this may actually be an acceptable method. It all comes down to the installation instructions for the appliance and the proper vent materials, which is based on the appliance category. avoids excessive condensate production in the vent. Category I: The vent relies on gravity to get the flue gases out, and it's not a condensing appliance. If you poke a hole in the vent, air will go into the vent; flue gas won't leak out. Because of this, the joints don't need to be airtight. This makes up most of the older furnaces that home inspectors come across, along with natural draft water heaters. If there's a metal vent coming up off the top of the appliance, it's probably a Cat I appliance. While some condensation might occur inside the vent, it shouldn't be much. 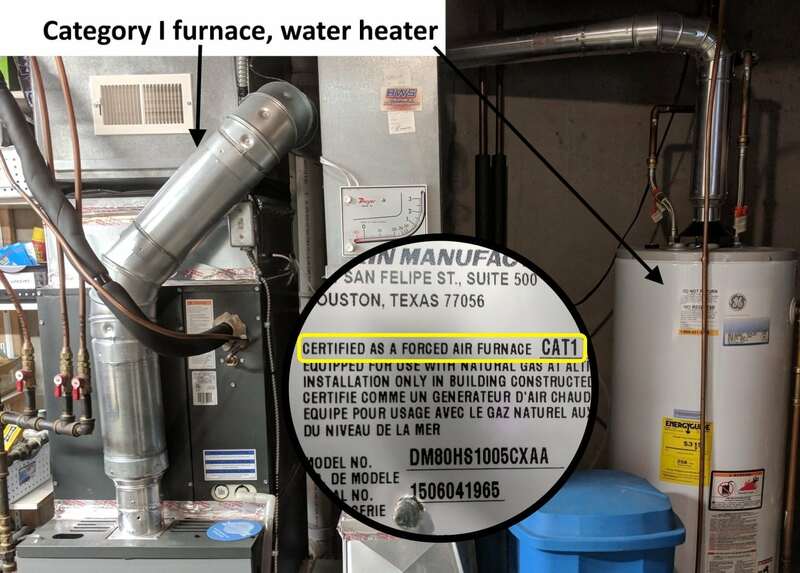 While a Category I appliance might have a draft inducer fan, such as the furnace shown above, the purpose of the fan is not to get the exhaust gases out of the home; the fan is only there to get the exhaust gases out of the appliance. After the exhaust gases have left the appliance, they're supposed to make their way up and out of the home through gravity. The instructions for venting these appliances can be found in a codebook. There's a ton of code-related information on how to properly vent a Category I appliance. Under normal circumstances, these appliances cannot be sidewall vented, whether there's a draft inducer fan or not. The vent needs to rise up through the middle of the building and terminate above the roof. Category II: I've never seen such an appliance, therefore it doesn't exist. Category III: The vent relies on a fan to push the flue gases out, and it's not a condensing appliance. If you poke a hole in the vent, exhaust gas will leak out. Because of this, the joints in the flue must be airtight. 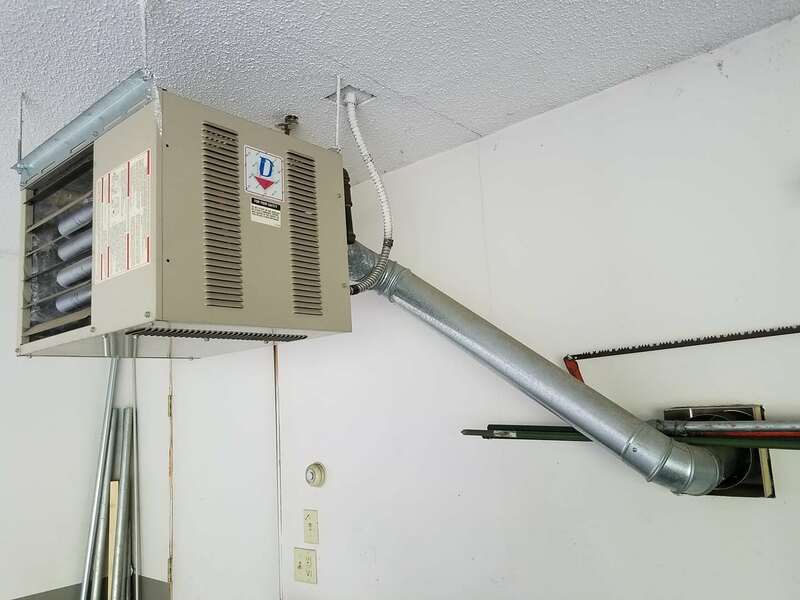 The only Category III appliance that I regularly encounter as a home inspector is a garage unit heater, such as the one shown below. It's acceptable for a Category III appliance to be sidewall vented, and the vent can even pitch downward. 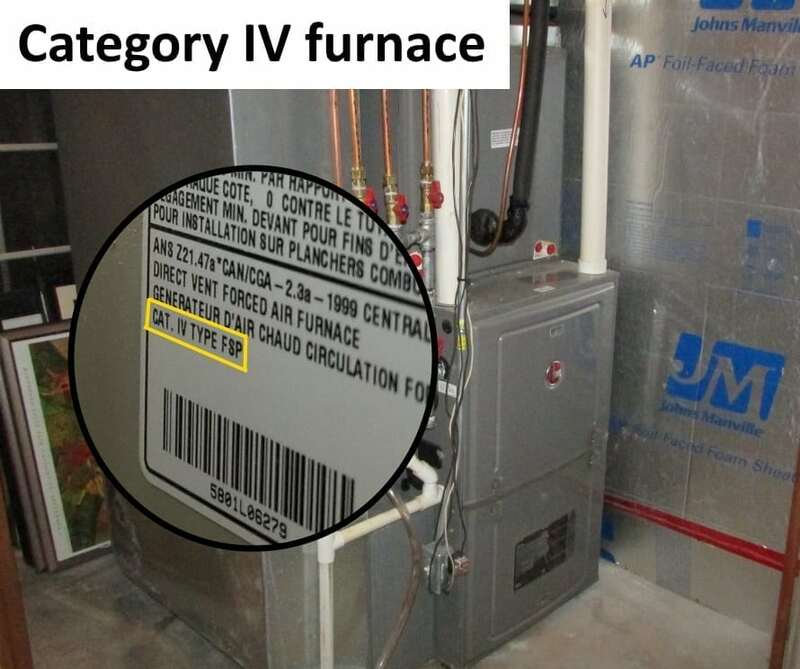 Newer UL standards, however, only permit the use of specialized Category III appliance vent material for residential installations that are sidewall vented. This stuff is gastight, stainless steel, and hideously expensive. 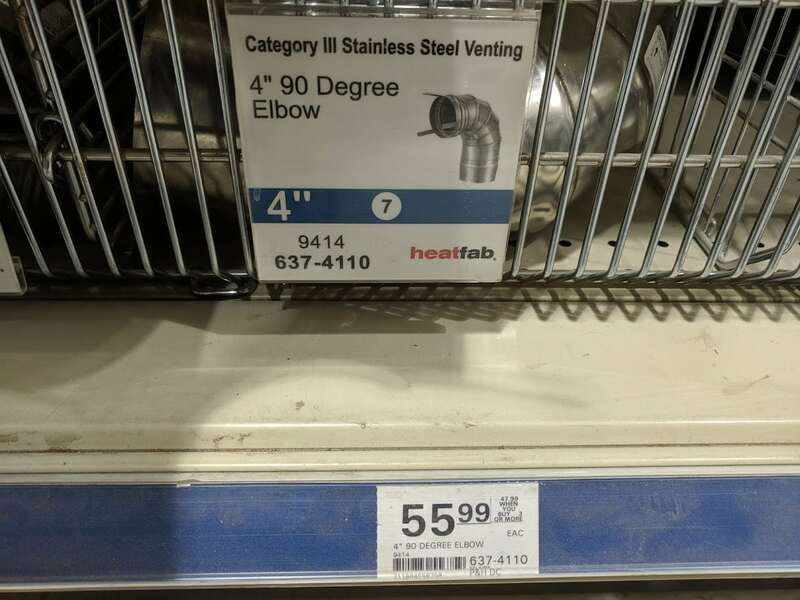 Check it out, Menards sells a three-foot section for $50, and a 90-degree elbow for $56. The manufacturer of a Category III appliance gives the installation instructions for the venting. 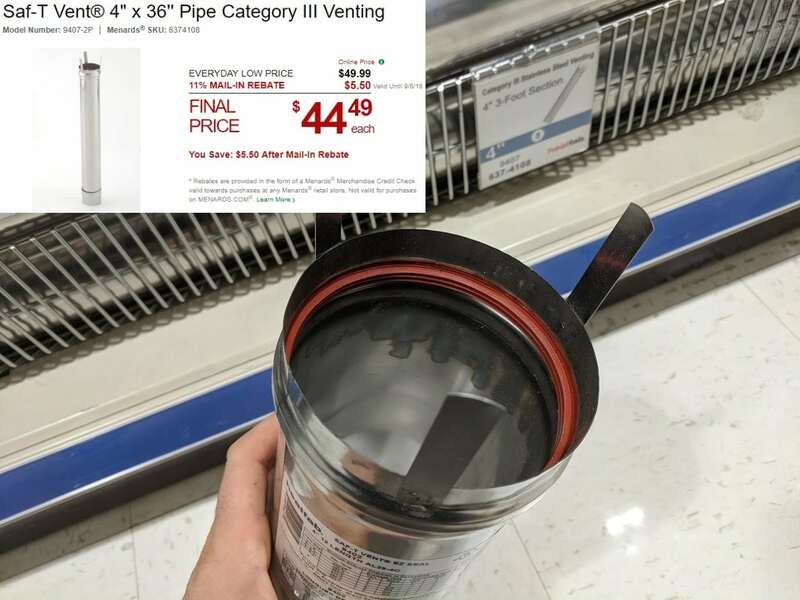 They say what the vent should be made from, how long it should be, what the terminal should look like, etc. I've seen some unit heater manufacturers mandate the vent pitch up, pitch down, or give the option of either one. Category IV: The vent relies on a fan to push the flue gases out, and it's a condensing appliance. Poke a hole in the vent and exhaust gas will leak out. The vents also need to be airtight and watertight. Most Category IV vents are made from PVC, but some older vents may use ABS. 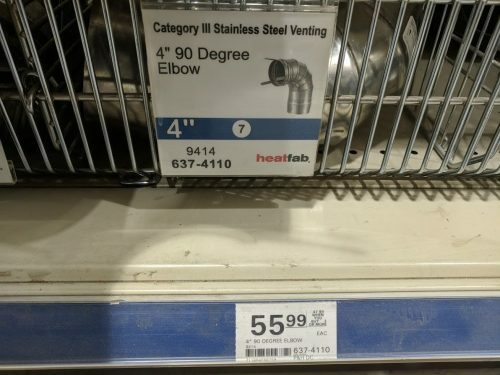 These vents are typically sidewall vented, and the manufacturer's installations instructions are quite specific about how the vent needs to be installed, just like Category III appliances. To determine if an appliance is properly installed, both the codebook and the manufacturer's installation instructions must be followed. In general, however, most of the information for a Category I appliance vent comes from a codebook. For a Category III or Category IV appliance, most of the information will come directly from the manufacturer's installation instructions. A quick Google search of "<model#> installation instructions" will almost always get me what I'm after. As a home inspector, I certainly don't make a practice of looking up the installation instructions for every appliance that I see. If the installation looks good, normal, and typical, I move on. If I see something unusual, I take extra photos and I look it up when I get home.